My mission to purchase camel milk yesterday resulted in a somewhat toasty warm hour and a half round trip walk to an Arabian supermarket. 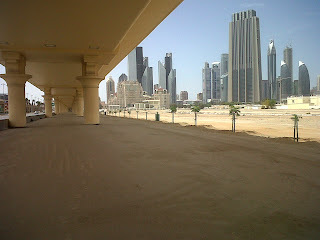 The Sand Warlock had the car for work so I set off on foot to the shop which is near the Rotana Hotel, where we had our dry Valentine's dinner. This picture is taken from underneath it so you can't see the Arabian decorations they've put on the side of it. It's a pretty yellow colour though with ornate pillars rather than sludge grey with a tramp living under it. Ah, the M4 tramp. I wonder how he's doing. Hopefully he's still shouting at the birds and putting up notices about people who've tried to beat him up. Unfortunately, the flyover has been built right next to the Rotana Hotel which I can't imagine thrilled the owners as some of the guests must have cars whizzing past a few feet from their luxury hotel room windows. It's that lack of accountability thing again. If the Government wants to build a flyover metres from a luxury hotel, they damn well do it, whether or not it's going to decimate whatever business the hotel may have had. On the other hand, people seem to care a lot less about such things here. In this pic you can also see a huge building that looks like a massive, elongated, toaster. That's the Index building where we looked at an apartment but decided against it because, among other reasons, it was really very, very high and the facilities are not and may never be finished. To the right of it, you may also be able to pick out what looks like not one but two buildings similar to London's gherkin but with what appear to be some form of contraceptive devices attached. That's the Dubai way, if someone else has done it, we have to do it better - ie twice. Not sure what the contraceptive devices are about though. It can be an odd experience going for a walk here because while there are some wide sweeping pedestrian friendly boulevards with palm trees, there are really quite a lot of 12-lane highways with tiny little pavements that you would be mad to walk along unless you're suicidal. Hence my decision to retreat under the flyover. It was hot yesterday despite the fact that we have had some rain and I'll be honest and admit that I did feel a bit of an idiot striding under a flyover sweating profusely and occasionally stopping to shake the sand out of my sandals as people drove past in their air conditioned cars wondering what on earth this lunatic was doing. The only other people I met on foot were some construction workers who had stopped for a break in the shade of the flyover. I kept my head high and walked past swiftly so they knew I was a very serious person who was on an important camel milk related mission and on no account were they to call mental health services. It's times like that that, as if the soaring temperatures are not enough, you're really reminded that you're in the desert. A lot of it is concreted or turfed over but you don't have to go far to be back on the sand.